Learn how to create your own beautiful bead caps and then rivet your caps to lampwork in this detailed two-part tutorial. In Part One you'll learn the basics of making bead caps, starting with plain discs and then drilling or punching the center holes. A step-by-step guide to using the Multi-hole Power Punch is included. After creating the bead cap blanks you'll learn to dome them for just the right fit on your lampwork. In Part Two you'll learn how to add a stunning new dimension to lampwork beads by securing your beautiful bead caps to them with your own handmade tube rivets. 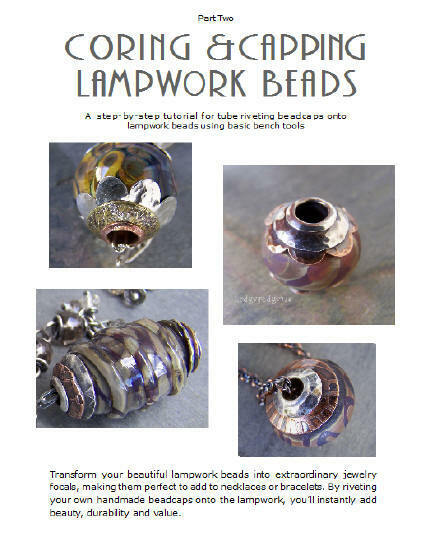 By riveting your own bead caps to the lampwork you'll instantly add beauty, durability and value. Please Note: While I do mention textures and finishes, the how-to's for those are not covered in this tutorial. Here's what one person said who tried the tutorial for the first time. "What a handy tutorial...exactly what I was looking for. I really love the look these caps add to my glass beads.."
After payment, you'll receive your two-part tutorial via email in a downloadable and printable PDF file. 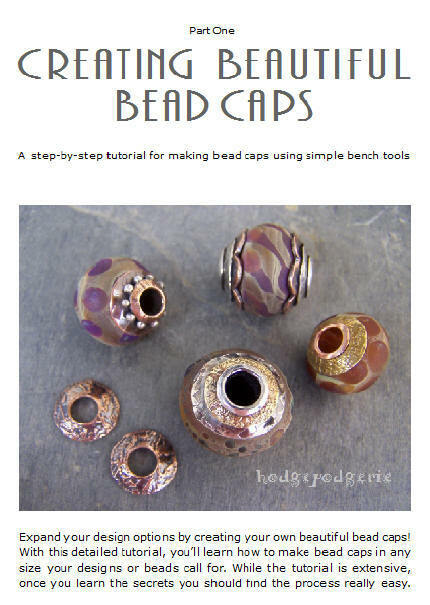 I know you'll really enjoy this fun bead cap tutorial. $7.95 - Click Here to Purchase. Return from "Beautiful Bead Caps Tutorial" page to "Wire Jewelry Tutorials" page.